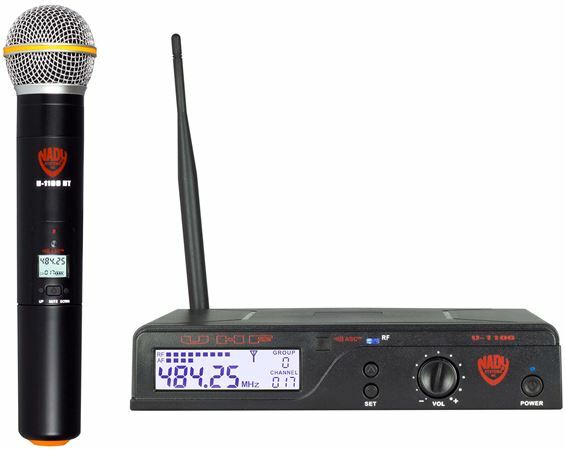 Order your Nady U-1100-HT UHF Handheld Wireless Mic System from AMS and enjoy 0% Interest Payment Plans, Free Shipping, Free Extended Warranty & 45 Day Money Back Guarantee. Featuring 100 selectable wireless frequencies, the U-1100 HT is equally ideal for both speaking and singing applications. Featuring a dynamic cardioid handheld microphone transmitter the U-1100 HT is packed with user friendly features like an amazingly easy set up with the ASC download function sending selected channel information to the transmitter. Clear and transparent audio with 120 dB dynamic range, an operation of up to 500’ (line-of-sight), a sophisticated. IF filtering for optimal simultaneous operation of multiple systems in the same location all included in a rugged ABS housing.